This is the story of How Santa Got His Job for kids. When Santa Claus was a young man, he went out looking for a job. Santa wanted no part of desks or offices. He liked to stay on the move. His first job was cleaning chimneys. Santa was sure-footed even on steepest roofs and he loved twisting through the tight spaces. But there was a problem. Santa was so neat that he never got covered in soot or made a mess in the fireplace. So nobody believed him when he said he was done. This lead to a lot of arguments. 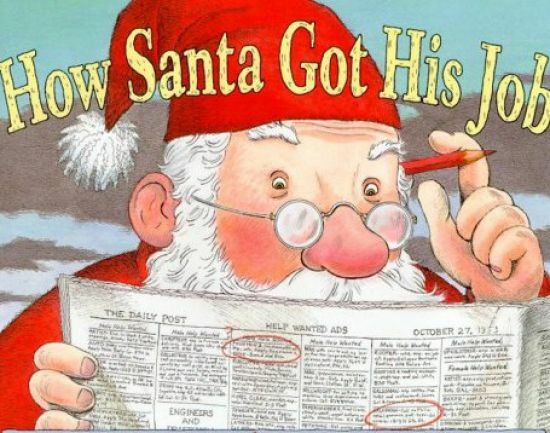 You may also like to read, Story Of Santa Claus. Santa worked for the post office next to where everyone could see he was doing his job. Santa’s favorite part was to bring packages to people all over town. To speed things up, he started making deliveries in the middle of the night. But there was a problem. No one was glad to see him at that hour. The postmaster got so many complaining letters that Santa had to leave. Since Santa had discovered he enjoyed staying up late, he tried at an all-night diner. It felt good to fill orders for customers. Sometimes Santa even surprised people with extra helpings. “Oh, I couldn’t eat another bite,” many of them insisted. “Well, maybe just one!” But there was a problem. Every night Santa tasted and sampled and tasted some more before he brought anything out of the kitchen. He gained a lot of weight. Hoping to get some exercise, Santa then found the spot at the zoo. He was very organized about the animals. “I know when they’re sleeping,” said Santa, “and when they’re awake.” Over time, he also learned whether they were behaving themselves or not. But there was a problem. Santa became close friends with the reindeer and all the other animals got jealous. Sadly, the zookeeper had to let him go. Also, read Rudolph The Red Nosed Reindeer Story. By now, Santa was starting to get discouraged. He didn’t even notice what the reindeer were doing behind him. They worked hard to cheer him up. Together, they joined the circus. Soon, the reindeer were shooting Santa out of a cannon three times a night. Santa liked flying through the air and wearing his new costume. He was a big success. But there was a problem. The ringmaster wanted to build up the suspense. “You need to look frightened,” he told Santa. “We want the crowd to worry about you.” But Santa was having so much fun for that. “Ho, Ho, Ho!” he always cried as he flew through the air. So, the crowd wasn’t worried at all. The angry ringmaster soon fired Santa and the reindeer. As they gathered their things, some elves came looking for their autographs. When they heard the news, they invited Santa and the reindeer home for supper. The elves lived way out of town. They were toymakers and their home was their workshop. Santa was amazed. “Children must love these toys,” he said. The elves looked embarrassed. They only made toys for their own pleasure. Selling them was too much trouble. “What if you give them away?” Santa asked. The elves haven’t thought of that. “I could deliver them for you,” Santa offered. There were enough toys here for children all over the world. The elves smiled and hired him on the spot. Also, read Santa’s Christmas. The elves made Santa a special sack that was always big enough, no matter how many toys were put in it.Then they built him a sleigh. The polar bears offered to pull it. They were very strong and whipped Santa across the snow. But there was a problem. It was the biggest one yet! To Santa’s surprise, this problem could be solved. Santa and the reindeer practiced every day. They made a few mistakes at first, but soon, they learned to work as a team. In the darkest part of winter, when people need their spirits lifted the most, Santa got ready to go. As the elves said good-bye, they gave Santa an emergency kit. It held a compass, ski goggles, cough drops, and other things. Santa thanked them very much. All his jobs had taught him it was good to be prepared. Then, Santa and his reindeer took off. That first night was a little hard because Santa was still learning about shortcuts and high winds. But at last, he got the hang of it. Ever since then, the elves have made toys and Santa has given them away in one night to all the good children. He loves his job as much as ever, and he has gotten pretty good at it over the years! You may also like to read, The Christmas Santa Almost Missed.